In most countries it would have been inconsequential. But for Ahmad Biasi, a young man from a small town in north-west Syria, the simple act of filming himself in his home town captivated the Syrian protest movement, made him a symbol of the nationwide insurrection – and may have put his life in danger. It began when he was filmed in a video uploaded onto YouTube last month. Just days before, another film had been broadcast on news networks around the world, purportedly showing Kalashnikov-waving security forces beating and stamping on prisoners who had been captured in the town of Al-Bayda, close to Banias in north-western Syria. Ahmad Biasi had been among those being beaten and kicked by gun-toting security men in the original video. The government responded by saying the video had been faked, that the uniforms of the security men were not right, and that the film had probably been shot in Iraqi Kurdistan. Presumably incensed by the lie, Ahmad Biasi set out to prove that forces loyal to President Bashar al-Assad had been as brutal as the video seemed to show. Using a mobile phone, he and his friends shot a long sequence of film which started by driving past the entry sign to Al-Bayda and continued with footage from the clearly recognisable town square where all the prisoners were held and beaten. 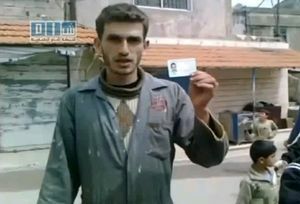 In an amazing act of bravery – an act which has amassed him a devoted Facebook following – he finished the video by standing in front of the camera and holding up his national ID card, thus proving to the world that he was the Syrian national in the original video. But his bravery came at a terrible cost. Earlier this month, Ahmad was arrested by one of Syria’s most feared intelligence units. Human-rights activists – who received reports last week that he had died under torture – told The Independent that had been held in a secret-service headquarters in Damascus. Before the weekend started, many people in Syria thought that Ahmad Biasi was dead. Human-rights organisations were receiving reports that he had suffered a terrifying final few hours at the hands of Syria’s secret police. Other human-rights organisations also received reports of Ahmad’s death. According to the Syrian Observatory for Human Rights, residents in Al-Bayda had feared that “Ahmad may have died after being subjected to severe torture”. Then on Saturday night, possibly under pressure from the growing publicity surrounding his case, Syrian state television dropped a happy bombshell. It ran an interview showing Ahmad Biasi sitting on a leather chair in a blank room expressing his “surprise” at hearing about his own death. Yet in spite of the dramatic turn of events, news of Ahmad’s fate may turn out to harm the Syrian regime more than it had anticipated when it released the footage. Activists have already accused the secret police of extracting a forced confession, while others are saying that the interview has inadvertently done what Ahmad intended to do in the first place: prove that he was Syrian and that the original video of government abuse did not take place in Iraq. His plight is also gaining online attention from growing numbers of people inside and outside Syria who view the activist’s case as something of a cause célèbre – a rallying point for a nation in tumult. Thousands of people have joined Facebook pages which have been set up in solidarity with Ahmad, while his case has attracted a small but growing following on Twitter. Despite saying earlier in the year that he thought his country was impervious to the revolts shaking the Arab world, President Bashar al-Assad is now battling to contain a nationwide insurrection which began in the southern city of Deraa and has since spread to other major cities. On Saturday, at least 11 people were killed in Homs when security forces opened fire on a funeral. The violence came a day after 44 people were killed in demonstrations around the country, according to the Syrian National Organisation for Human Rights. 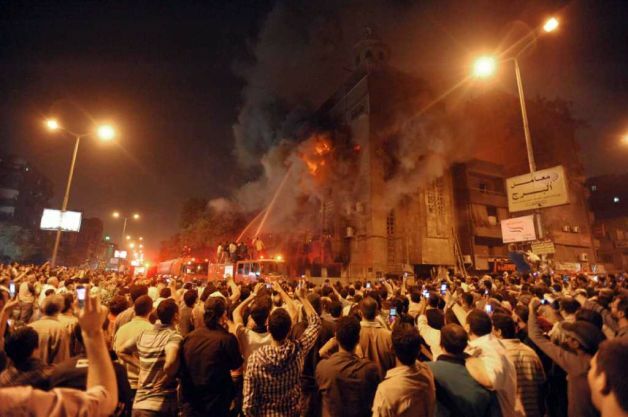 Rights groups say 850 activists have died and many thousands have been arrested and tortured since the uprising began. Just a few yards away from the alter in Saint Menas Church, and not far from a large painting depicting the resurrection of Christ hanging on a nearby wall, the floor was sticky with blood. He was just one of 12 people who were killed during violent clashes between Muslims and Christians which flared up on Saturday night in Imbaba, a dirt-poor district of western Cairo. The pitched street battles continued into the early hours of yesterday, and two Coptic churches were set ablaze in a night of unrest which also left 200 people injured. The trouble began on Saturday after a rumour spread around the neighbourhood that a woman was being held against her will in the Saint Menas Church because she had married a Muslim man and wanted to convert. The claim was denied by Christians at the church and never substantiated, but by nightfall several hundred members of the Salafi movement – a hardline branch of Islam which has become increasingly vocal since the fall of the former president Hosni Mubarak in February – had gathered in the street outside. After barricading themselves inside the church, the Christians were attacked by Salafists, who hurled petrol bombs at homes and shops and torched the front of the church building. Egypt’s government moved swiftly to try to quell the unrest, with Prime Minister Essam Sharaf cancelling a tour of Gulf Arab states to chair a cabinet meeting where it was decided to deploy more security forces near religious sites and toughen laws criminalising attacks on places of worship. The military, struggling to maintain security and public support in the aftermath of protests earlier this year, said that 190 people would be tried in military courts over Saturday’s violence.